Bishops congratulate the Holy Father Pope Benedict XVI as he celebrates the 60th anniversary of his ordination to the priesthood on 29 June, the Feast of Saints Peter and Paul. Since his election as Bishop of Rome on 19 April 2005, Pope Benedict has led the Church with faith and humility and has reached out to many people. In his pilgrimages he has spoken the truth with love and presented the gospel of Christ and the teaching of the Church in an engaging way to audiences of all ages. We invite the faithful in parishes and dioceses across the country to participate in 60 hours of Eucharistic adoration with the intention of praying for the sanctification of the clergy and for the gift of new and holy priestly vocations. Celebrations might include 1 July, the feast of the Sacred Heart of Jesus and the World Day of Prayer for Priests. This celebration, which was suggested by the Vatican Congregation for the Clergy, provides the faithful with an opportunity to give thanks for the priestly ministry of Pope Benedict as well as to pray for vocations to the priesthood and religious life. – the active implementation of these standards, following that guidance, by Church personnel in every parish and Church organisation across the country. 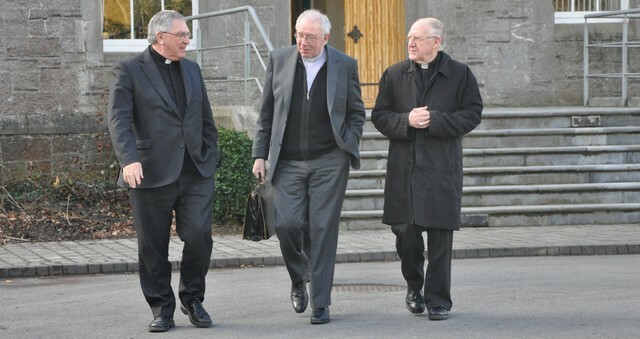 Bishops recognise the ongoing hard work of the National Board in its three core roles of: developing policies and procedures, advising, monitoring and reviewing. With regard to its third role, monitoring and reviewing safeguarding practice, progress has been slower than hoped for; we share the Board’s frustration in this regard. This is due to difficulties in the implementation of civil law in relation to data protection. Data protection difficulties are real; they were not fabricated or invented to prevent progress. In fact lawyers acting for the National Board itself, as far back as 2007, alerted the Board to the likelihood that data protection law could pose difficulties in this area. Three years later, in 2010, the Board engaged with the Data Commissioner to deal with these issues. In his latest annual report the Data Commissioner refers to his dealings with the National Board on this matter, speaking of a “successful navigation of the complex data protection issues that must be considered when examining the processing of sensitive personal data by a large number of separate, constituent organisations.” To address the complex data protection issues that exist, bishops ask Government to take the necessary measures so that the National Board can fulfil its full remit in terms of receiving and sharing information with Church bodies, as it was established to do in the first place. Bishops expressed their support for efforts aimed at achieving greater consistency in safeguarding policies and provisions in both jurisdictions on this island in regard to data protection and information sharing. The Board’s Annual Report demonstrates significant progress in policy development and training. The cost of training safeguarding volunteers is now borne directly by individual dioceses and congregations. Bishops look forward to continuing their work with the Board and resolving remaining issues as quickly and as comprehensively as possible. A Eucharistic Congress is a major international event in the life of the Universal Church. It was a very special event for the Church in Ireland in 1932 and will be again next year but in a very different context. The Catholic Church in Ireland is marking the one-year count down to next year’s International Congress by hosting a National Eucharistic Congress in Knock on 25 June next. Thousands of people from parishes all over the country will travel to Knock to take part in special events, workshops, celebrations and prayer – including Saint Joseph’s Young Priests Society. The Knock Youth Festival is also running at the same time as the National Eucharistic Congress. The celebration in Knock is a chance to focus on the local community and the pastoral preparation in Ireland for the International Congress next year. The International Congress is not just a once-off week of events in 2012, but a journey of renewal for all of us. This is an opportunity to remind ourselves that we are part of something bigger than ourselves and to do something together – in communion – as one body. Today the Irish Church is setting out on a new path of healing and renewal, inspired by Pope Benedict XVI’s Pastoral Letter of to the Catholics of Ireland of March 2010. The Church needs healing and reconciliation. The Eucharistic Congress offers us the possibility for renewal. Catechetical and pastoral programmes are already underway in parishes and religious communities across the country. Next year’s 2012 Eucharistic Congress takes place just fifty years after the opening of the Second Vatican Council and the theme chosen for the Congress in Ireland is “The Eucharist: Communion with Christ and with one another” and this focuses on the teaching of the Council. The liturgies and the other events which will take place each day from June 10 – 17, 2012 will focus on one or other theme reflected in the light of the Eucharist, such as, marriage and family; ordained and lay ministry; the Sacrament of Reconciliation; religious life and Our Blessed Lady; Mary, as hearer of the Word. The Missal contains all the prayers and instructions for the celebration of the Mass. From 11 September next, in dioceses and parishes throughout Ireland, people will experience the first changes to their prayers and responses at Mass. Only a small number of changes will affect the congregation and the order, structure and readings of the Mass are not changing.